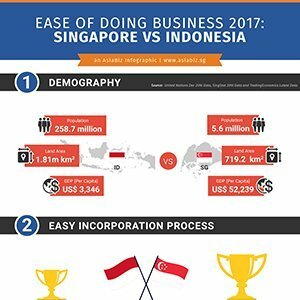 Home » Infographics » Incorporation » Should you set up your business in Singapore or Indonesia? Let us help ease your decision-making with the infographic below. Measuring indicators such as Demography, Company Incorporation Process, Corporate Tax Rate, Internet Speed and IP Protection Laws in both Southeast Asian countries, we too take into account the strengths of Singapore, her vibrant startup eco-system and the availability of government grants and venture capital injection. Singapore VS Australia – which market is best for your business? 4 Factors to Consider before Starting a Business in Singapore Ease of Doing Business 2017: Singapore vs India Running a business and deciding between entering Singapore or the United Kingdom?